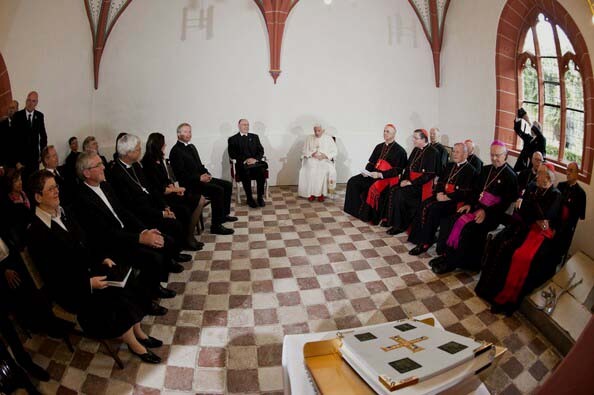 On September 23, 2011, before Benedict XVI went to celebrate an ecumenical service in the chapel of the Lutheran monastery of St. Augustine in Erfurt, he met the council of the so-called Lutheran Church in another room of the same monastery. An overview of this meeting is what is pictured above. After this first meeting ended, Pope Ratzinger - led by Nikolaus Schneider, leader of the Lutherans - walks through the monastery cloister to the chapel, first row below; in the second row he enters the chapel; third row, he bows before the altar that holds nothing but a bible. The fourth and fifth rows give general overviews of the chapel audience as the Pope is seated in the presbitery, as an equal of the heretic bishop Schneider, before he delivers his message. The sixth row shows us a close-up of him reading his speech. In the seventh row a photo for posterity with the heads of Protestantism in Germany. These are documents that attest to the bold steps of the Great Apostasy, which mock the past of the Catholic Church, deny her Holy Faith, abandon devotion to Our Lady and the Saints and head toward a Pan-religion independent of God.